It’s no secret that Austin has openly and unapologetically embraced the green, tree-hugging granola way of life (but in a hip way), and although it seems like you can find a shot of wheat grass and a green juice by simply turning over a rock, sometimes there may seem to be so many options, that you don’t know where to go. Lucky for you, I’ve come up with a list of of my favorite healthy restaurants in Austin. Recently opened by the restaurant group behind Kerbey Lane, this is quickly becoming a go-to for local Austinites as they cater to a variety of dietary restrictions/lifestyles with delicious food and insta-worthy decor to boot. They’re open all day (starting at 6:30 am) and will surely be added to many “best new restaurant in Austin” lists. Their motto is “honest food that tastes really good” and I couldn’t agree more! The inspiration for the food is based on an anti-inflammatory diet, focusing on great flavors, and takes popular trends in cuisine and pairs them with healthy living. They offer vegan, vegetarian, or gluten-free options so there’s something for everyone, and also have a variety of fresh squeezed juices, tinctures, and healthy cocktails to help wash it all down. Perhaps my all time favorite salad (pictured), the Tuscan kale, is also sold here. Leaf has been one of my favorite healthy food restaurants in Austin for a very long time. I worked downtown for almost 9 years (and now live downtown), and when I get a hankering for a crisp and delicious salad, Leaf is my go-to. They have (at least they used to) 12 signature salads, along with a build-your-own option, so you can’t go wrong! Flower Child is True Food Kitchen’s sister restaurant, and they recently opened their downtown Austin location! I love the concept of the restaurant, the decor, the food–everything. Flower Child’s fundamental promise to serve “healthy food for a happy world.” It means sourcing locally, and working with farmers who protect and love their animals. Their proteins are all raised naturally, without additives. They serve organic produce. It’s food that tastes good so you feel good, and they also have vegan/vegetarian and gluten-free options. Blenders & Bowls is another go-to for me. When the weather is warm, I go and grab an açai bowl from them at least once a week. In my opinion, they were the OG’s in introducing the ever-popular-on-social-media açai bowl to Austin, and no one does it as well as they do! My favorite is their Green Bowl, made with açaí, avocado, spinach, banana, and vanilla almond milk, and topped with hemp granola, cucumber, strawberries, sliced almonds, and honey. I also love their pitaya bowl with peanut butter or almond butter–believe me, it’s an incredible combo. Good news: they have another location in Westlake too! This is a great place to get a fantastic and enormous salad, along with some fresh squeezed juice, kombucha, drinking vinegars and more. It’s set in a bright, cheerful atmosphere and has a wonderful outdoor patio. They also serve hearty sides and delicious sandwiches. Juiceland is one of a handful of many Austin juice bars that has several locations around town. You can expect fresh juices, superfood smoothies, and delicious gluten-free to go salads from them. They have countless locations around town. Café no Sé has nailed the California-style restaurant concept by serving incredibly delicious and (for the most part) healthy food in a chic, modern and rustic space inside the South Congress Hotel. They change-up some of their menu items seasonally, and their shredded kale salad with cauliflower, crispy rice, currants, dill cucumber, and sherry vinegar is one of my favorite salads in town! They’re also known for their avocado toast (or seasonal toasts), as well as their burger. Juiceland and Daily Juice used to have the same partners, and I think the story goes they decided to part ways, so there are many similarities between the two places. For me they’re somewhat interchangeable, and I like one equally as much as the other. The great thing about Daily Juice is that they have several locations around town as well, so you’ll never not get your juice fix! This place is great, they not only offer fresh, made to order juices and smoothies, they’re also known for their delicious and heart warming soups. You can pop in and buy some soup, sandwiches, salads, or refreshing drinks, or you can get a week’s worth of soup delivered to you via Favor. Mad Greens is another salad place that also serves paninis, wraps, juices, and soups. They currently have a location at The Domain Northside, Downtown, and also have a south location as well. If you go here, you can actually see the nutritional info change as you add or remove items from your salad, so this is a great option if you’re counting your macros. 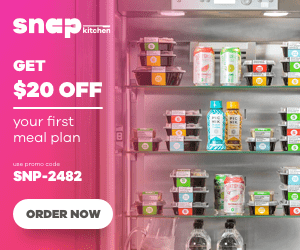 Snap Kitchen is my go-to when I want to get healthy, pre-cooked, delicious food on the go. Sometimes I’ll buy several days worth of meals here, knowing that I’m not only getting yummy food, I’m also putting wonderful nutrients in my body. I love that it’s easy to pick your meals based on dietary preferences, such as low carb, paleo, gluten-free, non-dairy, vegan, etc. They also offer meal plans based on dietary preferences, so now you can stick to those new years resolutions of sticking to a healthy diet and losing weight If you use code alow-6dm, you’ll get $10 off your online order! Yes, another juice place (there are lots in this roundup) but juice is a great way to get nutrients straight into your blood stream, and I love that Juice Society also has smoothies and sweet and savory toasts. They have a delicious avocado toast, as well as a banana toast that will satisfy any sweet tooth. You also have the option to select from a variety of 100% organic cold-pressed juice and nut-milk for pick-up or delivery. Paleo lovers rejoice! This is one of the few places in Austin that really hone in on Paleo-centric meals, and they “focus on truly natural grass-fed and pastured ingredients that make you feel and perform your best”. They also serve butter coffee, bone broths, and delicious gluten-free pastries. The Beer Plant opened just a few months ago, to the joy of many people living in Tarrytown. It happens to be a vegan restaurant, but don’t let that fool you. The Beer Plant is a gastropub that just happens to be vegan, and serves up 40 craft taps along with hearty plant-based dishes in farmhouse-inspired digs. The menu has a focus on fermentation, including house-made breads, pickled vegetables, and cultured vegan cheeses and butters. With menu items like Buffalo Cauliflower Wings, Reubenesque sandwiches with portabella mushrooms, sauerkraut, tomato chutney, caramelized onions, swiss cheese, mustard mayo on 20% Rye Sourdough, and other delicious options, you may not even miss the meat. Casa de Luz is a plant-based restaurant in Austin, serving 100% organic, vegan, vegetarian, alkalizing, nutrient-rich meals that will improve your health. All their kitchen water is fluoride filtered, and their meals are gluten-free. Each day the menu changes, and each lunch and dinner meal include soup, salad, and a vegetable entrée, dark leafy greens with a delicious whole-food sauce (no oils), a whole grain like organic brown Rice, millet or quinoa, occasionally topped with Sea Vegetables, seeds or nuts (they presoak their grains), beans, and some sort of fermented vegetable like kimchi or sauerkraut (which is GREAT for digestion). There’s no way you’ll leave this place hungry (plus it’s fun to watch the children play in the playground!). One of Austin’s original vegetarian restaurants (it’s been around since at least the 80’s), this is a great place to get a delicious meal just north of Campus in Hyde Park. They have everything from soups, salads, enchiladas, sandwiches, pasta and so much more. They can also make some of their dishes nut free and gluten-free, as well as vegan. Counter Culture is perhaps my favorite healthy restaurant in Austin, and it just so happens to be a vegan restaurant. Whenever I get a craving for a pizza and I want to “be good”, I head over here, because their pizza never disappoints. They’re also really great at accommodating dietary restrictions, and can make most of their meals gluten-free, soy free, and they’re Engine 2 diet friendly. Another vegetarian restaurant in the Bouldin neighborhood that is quintessentially Austin. I love Bouldin because they offer breakfast all day, and they have one of my favorite sandwiches in town! The Veggie Royale is a veggie patty served on grilled ciabatta bread with green leaf lettuce, tomatoes, and red onions, then I add their chipotle-pecan pesto sauce, and jalapenos. As a side I choose their asian slaw, and that meal is one of my favorites in Austin. I think this place will make any vegetarian shunner or self-professed “meat lover” not miss meat at all. Citizen Eatery is a “rethought approach to meat-free dining in a casual, contemporary setting.” Their menu consists of local, scratch-made, farm to table food that is also paleo friendly. They serve breakfast all day, and are open from 10:30 am on until 9 pm, so this is a great spot to pop into at any hour during the day. Success! Now check your email to confirm your subscription and download your guide.